The cooler Northeast Ohio winter months should not mean a break for your commercial property maintenance. Although the temperatures are lower, and your plant growth slows down, there are many opportunities for maintenance that can allow your plants to thrive in the spring and summer. Landscape maintenance and tree care should continue throughout the winter to help guarantee healthy plants in the spring. Let’s look at some of the great benefits of maintaining your commercial landscape through the winter months. A great way to optimize springtime’s vibrancy and stability is to maintain your commercial landscape maintenance. 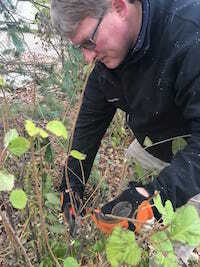 Trees and shrubs thrive with the right care through the colder, Northeast Ohio winters. Wilt-Pruf and Burlap: Applying Wilt-Pruf to trees & shrubs to prevent winter burn or wrapping shrubs & arborvitae in burlap to prevent salt & wind burn are common ways to protect plant material in the frigid months. With the winter months comes the loss of color due to falling leaves and after the first frost your flowering plants visually suffer. Incorporating evergreen plants allow commercial landscapes to look warmer and more inviting year round. You can also create festive potting arrangements using evergreen plants, boughs, colorful branches and winter lights. Bulbs offer early color, blooming before spring. Plant them before the ground freezes and you will be rewarded with a pop of color before the season changes. Plants like perennials and shrubs require very little care with the lower temperatures, however, depending on the species, it may be a good idea to apply Wilt-Pruf to prevent winter burn. Do not be fooled into believing that diseases and pesky insects are nonexistent in winter. Although they slow down, they can cause damage to your plants and reduce your property’s curb appeal. One disease to keep an eye out for when winter is winding down is snow mold in your turf. Maintaining your commercial property during cooler months will ensure both short and long-term health to your landscaping. Wintertime is the optimal time to save money on tree removal. With the colder months comes more savings as tree removal companies transition into a slower period. Take advantage of these savings by taking down the larger tree on your commercial property. If maintaining your commercial landscaping budget is at the top of the list for you this season, reusing the plants that you already have growing on your property is the best way to go. Simply splitting “multipliers” like some perennials by moving them to areas that need a little more color is a great way to improve your landscaping while saving a little more money during the cooler Northeast Ohio winters.